$3/day up to 8 fish. Prices are not including 5% GST. Please feel free to contact us for off season rates. Our docks and moorage area are located in front of our Marina Office. We offer numerous moorage slips for a wide range of boat lenths. 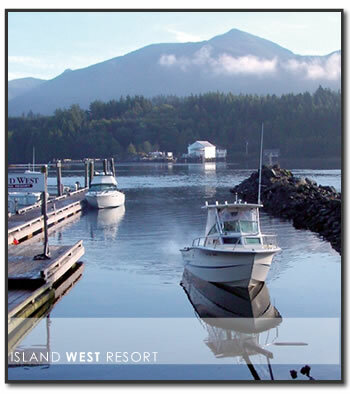 Moorage for short or long term visits in our protected harbor is available with storage for boat trailers nearby. Fish cleaning tables for moorage and charter guests are also available. For those of you who would prefer to sit back, relax and experience fishing at its best we have fully guided fishing charters available. Our Marina Store is located just below our Eagles Nest Pub. Our store is stocked with: bait, tackle, ice, shower tokens for our shower facilities, amenities for our Laundromat, freezing facilities for moorage and charter guests, snacks, refreshments, etc. Boat launches are also available (Please check in with the Marina Office prior to launching as a fee does apply). Start your day with a cup of fresh coffee available early each morning!